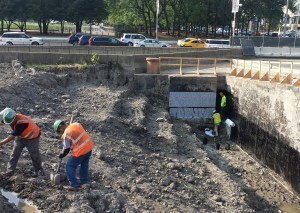 Western Specialty Contractors – Chicago Concrete Restoration Branch, a member of Western Construction Group, recently completed a mammoth project to restore and waterproof a 750,000-square-foot concrete parking garage (equivalent to 12 football fields) located underneath the newly designated, 20-acre Maggie Daley Park in Downtown Chicago. Western served as the general contractor on the garage project. Formerly known as North Grant Park/Daley Bicentennial Plaza, Maggie Daley Park is part of a larger network of adjacent parks including Millennium Park to the west and Grant Park to the south. It is bordered on the east by Lake Michigan and Lake Shore Drive. This entire park system was built on top of underground garages. Together these interconnected garages comprise the largest parking facility in the country. The vicinity of land that these parks occupy was previously an underutilized rail yard. Named after Chicago’s beloved former first lady, Maggie Daley, who died of breast cancer in 2011, the iconic Maggie Daley Park was designed to breathe life back into the downtown area. A portion of the park, including a 40-foot-tall rock climbing wall, play garden and ice-skating ribbon that can accommodate 700 skaters at one time, was opened to the public in December 2014. Additional work on the park is scheduled to be completed in Spring 2015. 2. Waterproofing and concrete repair work to the concrete parking garage by Western Specialty Contractors. 3. Re-installation of the park and construction of its new features by Walsh Construction. The concrete parking garage, originally waterproofed in the 1970’s, had become compromised from years of wear and tear and ground water infiltration. Essentially a giant green roof, ensuring proper waterproofing of the large parking structure was key to maintaining the park’s overall integrity and sustainability. 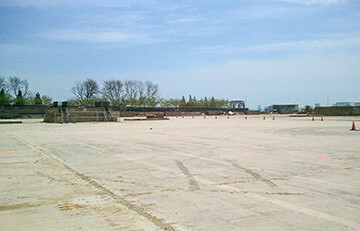 Should any leaks or drainage issues occur to the garage in the future, the new park and its amenities would have to be pulled up and the entire parking garage re-waterproofed – a timely, costly and disruptive measure that the waterproofing team did not want the city or its residents to have to endure. There was no room for error on the project. The project was full of challenges along the way related to logistics, coordination with other contractors, a tight schedule, public relations, location of the project, and the sheer size of the job-site. In order to help with job-site logistics, security and contractor coordination, high definition cameras were installed high above the park to record the site 24/7. These cameras were used on a daily basis by the management team to coordinate daily activities, work locations, material staging locations, as well as job site safety and security. 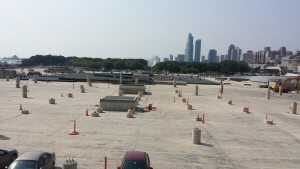 The project began with Desman Associates, a Chicago-based engineering firm, to brainstorm solutions to resolve the parking garage’s major drainage issues. While the parking garage sloped naturally from north to south, pooling water had become a problem in specific areas of the park, due to the lack of drains throughout the massive garage roof. This problem was solved by the installation of numerous new drains and a composite drainage mat system. 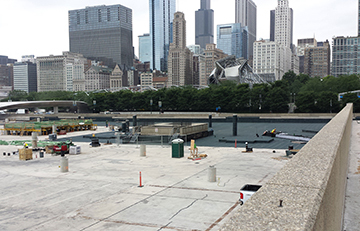 After the existing park (North Grant Park/ Daley Bicentennial Plaza) was completely demolished and removed from the site, work began on preparing the 750,000-square-foot surface for application of the new waterproofing system. The entire surface of the concrete roof was power washed and then shot-blasted to achieve the proper surface profile required by the waterproofing manufacturer, as seen below. Next, installation of the waterproofing system began. 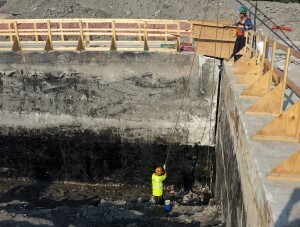 The waterproofing system, manufactured by American Hydrotech, consisted of seven layers, which all serve an important function in the overall operation of the system. Applying the system consisted of spraying the concrete deck with primer. The first layer of the system consisted of melting rubberized asphalt bricks to a liquid state by heating the 40 lb. bricks to 400 degrees in a kettle. The rubberized asphalt would then be poured out onto the concrete, while it was still hot and in its liquid state. Workers then spread the rubberized asphalt out to evenly coat the area. In total, this project required over 1.3 million pounds of rubberized asphalt applied by multiple crews consisting of 40 workers per day. In order to fast-track production, all crews worked from opposite corners of the deck, then slowly worked their way to the middle. After the first layer of rubberized asphalt was spread out, workers rolled reinforcing felt fabric onto the layer of melted rubber, while still in its liquid state. Another layer of melted rubber would then be poured and spread out over the area. The next step required workers to roll out sheets of heavy-duty, rubberized asphalt protection board, which was specially made to prevent tree roots from puncturing the waterproofing. The final layers of the system included a drainage mat, filter fabric and approximately 400,000 cubic feet of gravel overburden. 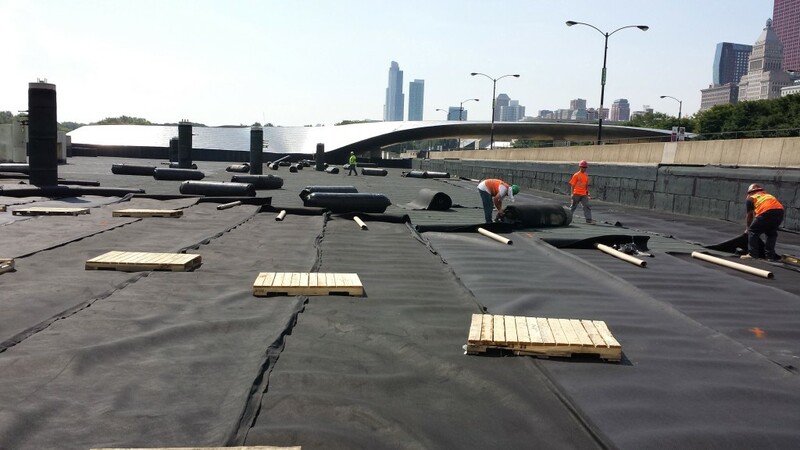 Western worked directly with the manufacturer to have special, extra large rolls of drainage mat made for the project. Standard rolls of drainage mat are 4’x75’ (300 SF) but American Hydrotech manufactured job-specific rolls that were 7’x150’ (1,050 SF). This helped to keep the project on schedule. Now that the entire deck was covered by the waterproofing system, no trucks were able to drive on the system without causing damage. This fact made the task of installing the gravel overburden a huge challenge. Utilizing the overhead cameras, a phasing plan was designed to accomplish the task. The plan allowed a few temporary access roads on top of the waterproofing (seen to the left int he photo below), which would then be leak-tested and repaired before overburden was installed on the access roads. A large conveyor truck was used to shoot the gravel over the waterproofing system, without needing to drive over the system. At the same time that waterproofing work was being completed on the topside of the garage roof, structural repairs were being performed on the underside of the roof slab. Coordination between crews on the topside and underside of the slab was a daily challenge for the management team. Use of cell phones was not an option due to the very limited reception inside the garage. To overcome this obstacle, Western’s management team was headquartered inside the garage for the duration of the work. This allowed constant oversight of the work being performed. 2. The detachment of two pedestrian access tunnels from the garage. Due to the excessive loads placed on the roof slab by the park above, the concrete slab was poured with additional reinforcing steel. This made removal of delaminated concrete more difficult. All 3,000 square feet of the concrete was removed using hand-held jackhammers. After removal, all exposed rebar was sandblasted and coated. When prep work was complete, concrete was re-applied using a dry mix, shotcrete method. Due to the messy nature of this method, Western took additional precautions to cover the floor, which prevented staining of the asphalt surface. As a nationwide corporation, Western Waterproofing used its resources to complete this work on a tight schedule by joint venturing with the St Louis Concrete Branch that had more experience with this application. At the completion of this work, over 1,000 cubic feet of concrete had been removed and replaced, requiring over 130,000 pounds of cement. Simultaneous to the work being completed to both the topside and underside of the slab, Western was also busy on the south end of the garage performing structural repairs that would disconnect two underground pedestrian access tunnels from the garage. The design team had noticed that these two tunnels were moving at a different rate than the garage, therefore creating large cracks which were proving to be tripping hazards for pedestrians. The design team intended on solving this problem by separating the structures from each other and installing an expansion joint to fill the void and prevent leaking. This task required Western to essentially rebuild a large portion of the tunnel. When the owner learned that Western was capable of performing much more than waterproofing and concrete restoration, Western was invited to perform additional repairs at another pedestrian access point on the north side of the garage. This access point was the busiest and most commonly used entrance and exit for the garage, which in itself created large challenges for completion of the work. The scope of work included full removal and replacement of about 300 SF of a 14” thick supported slab. This slab served as a stair landing for the exterior pedestrian entrance. The owner required pedestrian access below the area of work at all times. In order to achieve this, Western had a large shoring system erected that allowed removal of the concrete to occur and also allow pedestrian traffic directly below. The garage restoration work took a total of 33,554 hours to complete, with about 45 workers on the job per day. Western used its own resources to self-perform over 95% of the entire scope of work. For additional information on this project, or if you’d like more information about Western’s services and expertise, contact Chicago’s Senior Branch Manager, Justin Berndt at JustinB@WesternSpecialtyContractors.com. We’d love to earn your business.